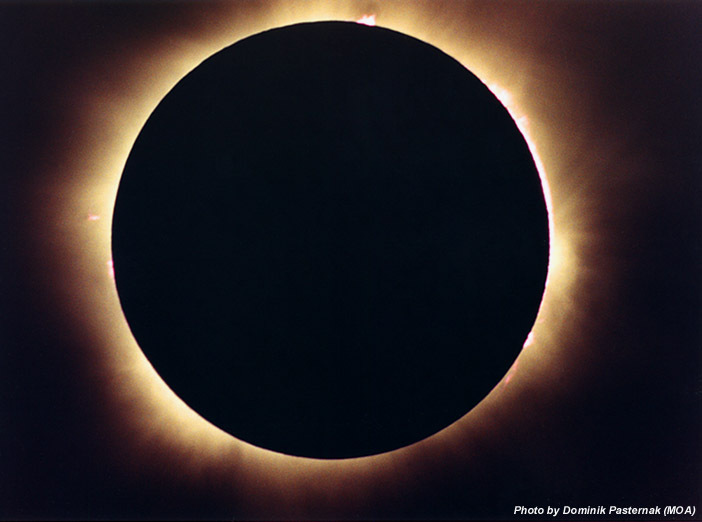 Explanation: During a total solar eclipse, Earth's moon blocks the sun - almost exactly. While the sun is about 400 times wider than the moon, it is also about 400 times farther away and each appears to be half a degree or so in diameter. On August 11, this remarkable coincidence in the apparent size of two vastly different celestial bodies produced tantalizing solar spectacles for denizens of Europe and Asia. For example, prominences along the sun's limb peer around the moon's dark edge in this dramatic picture of totality recorded as the lunar shadow swept across Hungary. Subtle structures in the sun's inner corona are also visible streaming beyond the silhouetted moon. This total eclipse of the sun was the last to grace planet Earth's skies for this millennium. Although four partial eclipses will occur in the year 2000, the next total eclipse will not be until 2001 June 21.